A creative branding expert needs to know how to market art and design objects in a way that doesn’t diminish their integrity while still making it an accessible product. That’s where Andreea Kay, CEO and Founder of Klangwelt, comes in. A designer herself, Kay got her start as a freelancer making leaflets, flyers and marketing materials for musicians and artists. 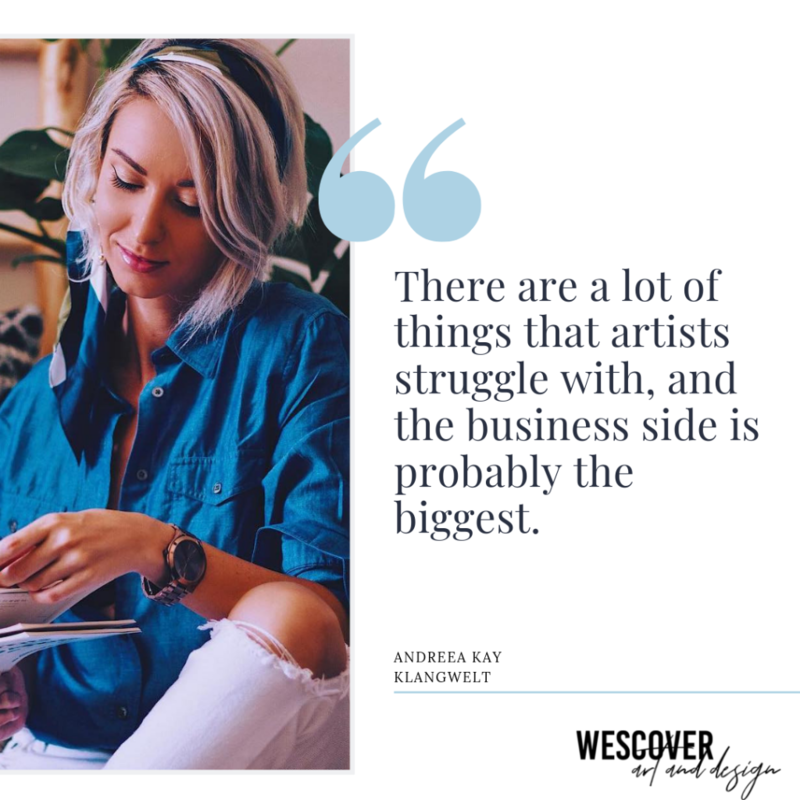 After leaving her hometown to start her career at an advertising agency, Kay made the leap into full-time entrepreneur after the 2008 recession. Flash-forward 10 years later, and Kay works with artists on the business side of things and on her amazing brand Klangwelt. 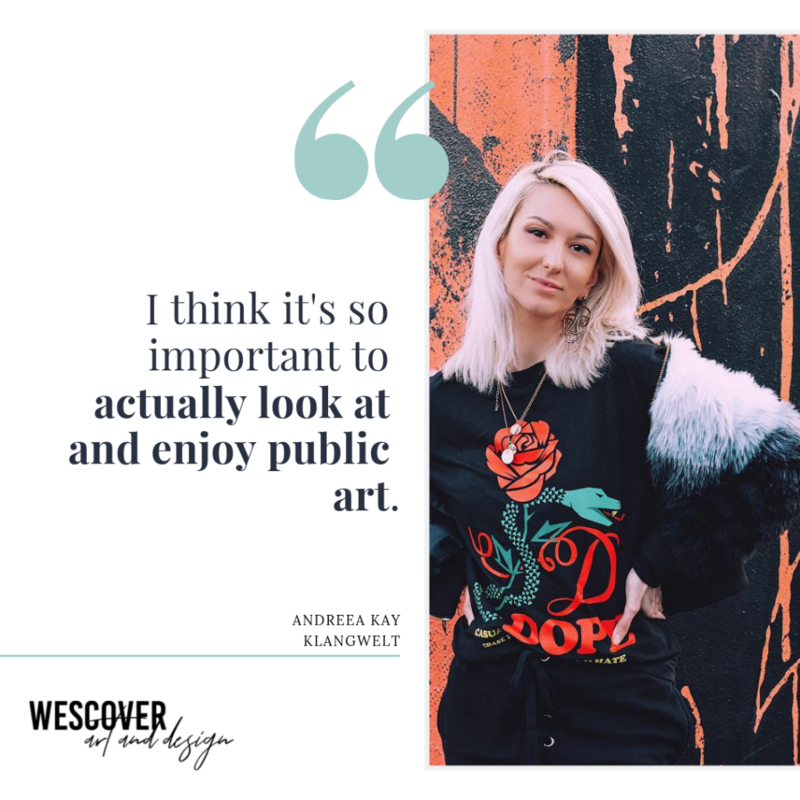 When we caught up, Kay shared her branding tips, design experiences, and her Wescover favorites! What do you enjoy about working with artists? I love working with artists from all disciplines (art, music, performance, fashion). Being an artist and creative person myself, I understand very well what they’re going through; what their pain points are; and also what would serve them the best. I think there are a lot of things that artists struggle with, and the business side is probably the biggest. Personally, that’s the least favorite part of my job. Art and creativity can sometimes be difficult to define or “box in” and therefore make it a marketable “product” which then you have to go out and “sell” to people. The key is to always find something unique about their art/craft and trust me – there’s ALWAYS something unique about them – and present it in a form that’s easy to understand for even the most novice of people. When I help someone reach their dream and grow their business because of the work I’m doing, it’s the happiest moment for me, so it makes everything worth it. It’s also very rewarding for me because it gives me this feeling of “we’re in this together” type of thing, as opposed to just being an external party, totally removed from the whole process, who’s just like a little robot executing orders and tasks. That style just doesn’t work for me, I need to have creative freedom and to be able to brainstorm with the client to find new exciting concepts and to really “get it”. What does your creative community look like? My creative community is spread all over the place. It has always been this way. I’ve always connected with artists and creatives from all over the world thanks to the internet and it’s so cool that nowadays we can do that so easily! I don’t know any Wescover artists in real life YET, but my goal for this year is to connect with more people locally and in real life, because while chatting online is great, sometimes just being face to face and “feeling the vibes” is a million times better. What are the best art/design events you’ve been to? SHINE is amazing! I’m really grateful to live so close to a city so vibrant when it comes to arts and culture. Basically, SHINE is a mural/street art festival where local and international artists come to paint buildings and public places downtown Saint Petersburg, Florida. 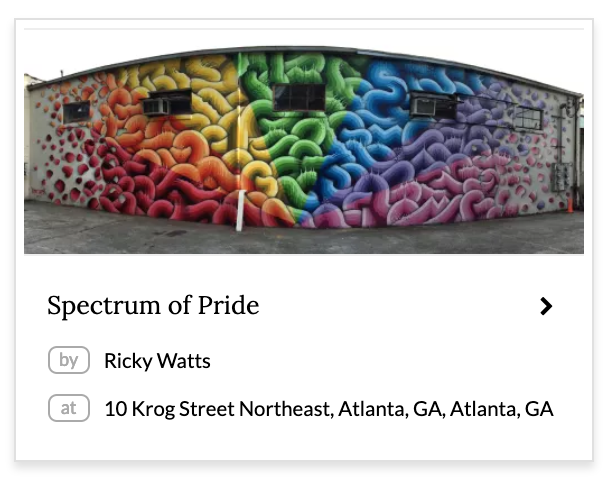 Anybody can watch and after the festival is finished, there’s actually an art walk tour available at the Morean Arts Center where art enthusiasts are welcome to stroll across the streets and enjoy all the awesome murals. It’s crazy because I have a few absolute favorite pieces, like Pinocchio by Mark Gmehling or the Skating Granny (I don’t know the actual name of the artwork) on the wall at the Morean Arts Center for example, which I stop and stare at for a few minutes every time I happen to be in the area. I feel weird standing literally in the middle of the street but I think it’s so important to actually look at and enjoy public art, because if this was a painting hanged in a museum you’d bring a chair to sit in front of it and you’d pay an admission fee to even be able to look at it. It makes me sad when people pass by and don’t even notice it. Still, to this day, I think the best art show I’ve ever been to was approximately 11 years ago in Bucharest (this was back in the day when I was still living in Europe) and this show combined music, performance art, installation, and technology all in one. I can’t remember the name of the show at this moment, but I will never forget that experience. It was an interactive experience and we had to go through different rooms and perform certain tasks in order to advance to the next area of the exhibit – almost like levels in a game. Very immersive and multi-disciplinary. What branding advice should artists keep in mind? I think it’s important to use a memorable alias and then secure all the digital platforms in that name. It’s not that using a first name + last name is a bad branding idea because there are tons of designers and artists who make it work. But sometimes it can be hard to remember (especially if there are special characters or a special spelling involved). People remember things that are catchy or punchy, and a lot of branding has to do with emotion. So when you’re able to create an emotional response in people (regardless if it’s positive or negative), you’re automatically being remembered. Having a website is not as important as it used to be thanks to all sort of social media type platforms where artists can showcase their work and talents. Though, I still think that having a website makes someone look a million times more professional. 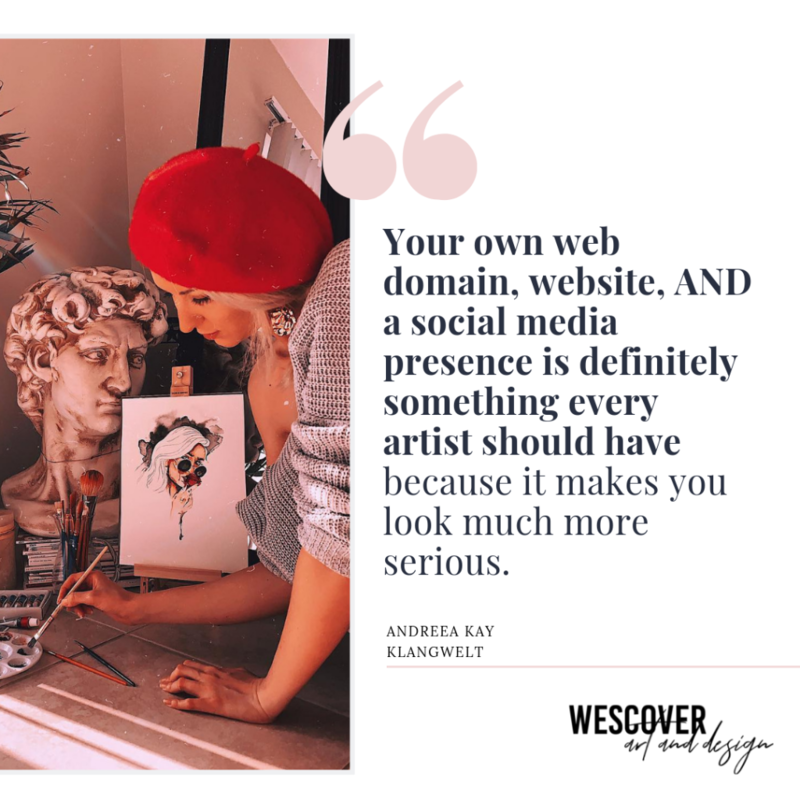 Having your own web domain and website AND a social media presence is definitely something every artist should have because it makes you look much more serious. Plus a website keeps your entire work organized and YOU own it, not a larger entity; you can do absolutely anything you want with it. There’s such a big difference even at something as simple as when I see an email coming from a Gmail address versus its own domain name. 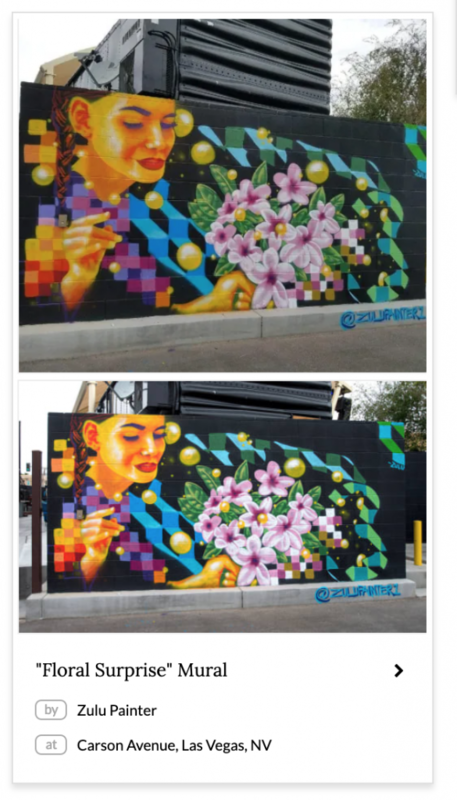 As a branding expert, what’s the difference between street artists and professional muralist? That’s a great question! First of all, the complexity of the artwork. A street artist usually has to practice their craft in a stealth manner and their work is less ample and less structured. 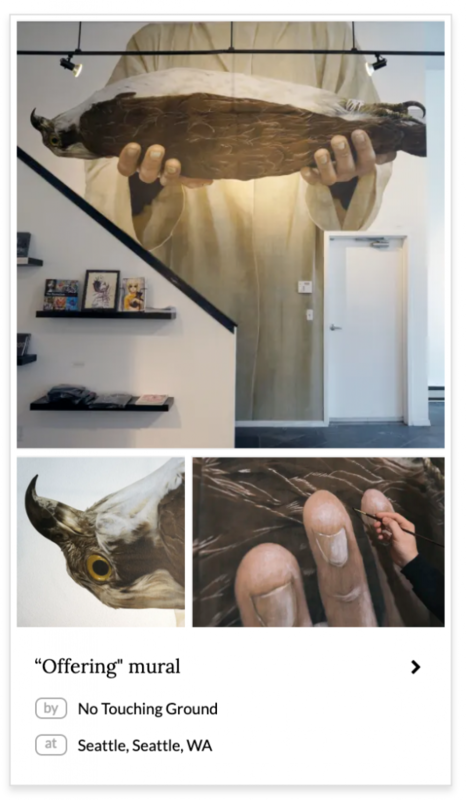 When a business or individual commissions a muralist, they WANT that art to be there on their wall and they are expecting it to have a certain aesthetic. Street artists don’t necessarily abide by rules or legislation, many times they’re not even doing it legally, they are more on the edge and (in some cases), their creative expression can be more free and raw (for example they can express social issues which otherwise wouldn’t be addressed). Also if we’re to stick by definitions, street art can be anything from sidewalks to abandoned vehicles and from staircases to rooftops. 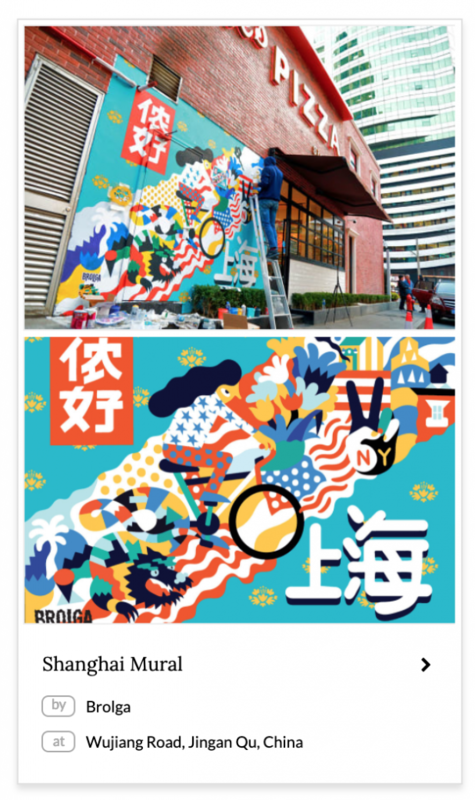 While mural art has to involve well… a wall. How do you follow trends in the art and design world? I like to follow trends and I think it’s very important to be aware of what’s going on around you. I don’t always adopt the trends or incorporate them into my work, but it’s important to know of their existence. It’s a vital part of being able to create designs or products/services that are viable and can survive “in the real world,” because the reality is that the world moves very fast and people constantly want something “new.” I usually follow these trends through social media or the web in general (Hypebeast anyone?) I think that’s where things appear first. I like it because this way I can be aware of trends happening in other parts of the world like Europe. While in the United States we experience different trends and play a guessing game about what things will catch on here or vice-versa. How do you think the art and design space has changed and is going to change in 2019 and beyond? I’ve seen a rise in entrepreneurship, especially in the lifestyle area. I think it all stems from us just wanting to be valued for who we truly are and not forcing our entire life into predefined patterns that just don’t seem sustainable for the rapidly changing world. So it’s only natural for people to seek guidance and help to design the life they want to live. As well as a life that can accommodate the increasing number of activities and demands which the world faces us with. I wouldn’t be surprised if we will see job titles like “lifestyle architect” or “lifestyle designer” soon haha 🙂 I’ve seen the trends being more and more centered around social issues and activism lately. It’s been happening for a while, but I think that now it’s affecting the world more so than ever. A lot of artists are now starting to express that and to draw attention over all the tensions. 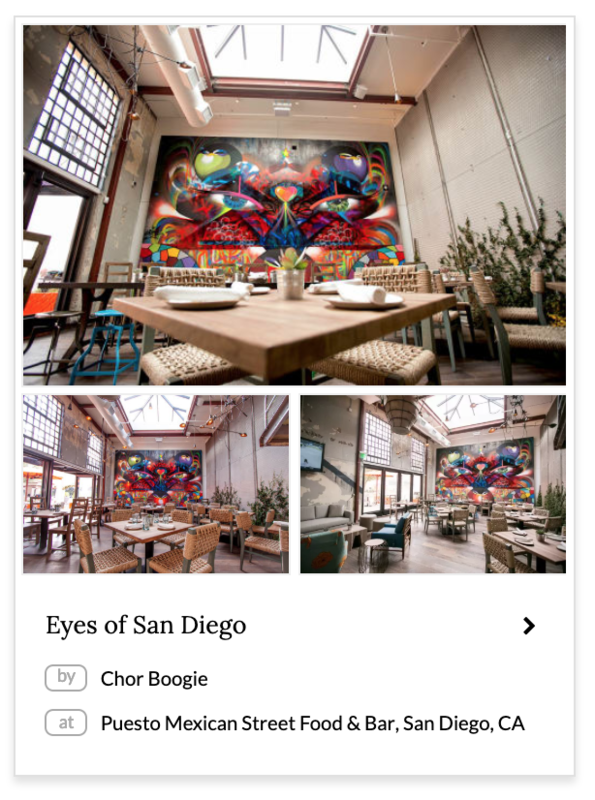 With attention spans being shorter and shorter, videos, interactive elements, and visual elements are going to become the norm in the consuming of any type of information. Information needs to be delivered fast and in an entertaining way. 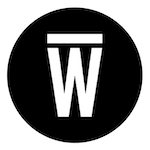 What is your favorite item on Wescover? It’s very hard to pick because I love so many styles and designs! I was really amazed by the Dichotomous Air for ETSY ceiling installation. I love how the sculpture looks modern and sleek while still maintaining an organic, warm, feeling. I really love pieces that are somehow at the intersections of worlds or mediums. I’ve also been completely captivated by the Interior Mural Installation in Emergence Northwest by Leo Shallat. The entire space is so fascinating and the mural is out of this world! I think this is another example of worlds coming together to create a fresh and harmonious experience. 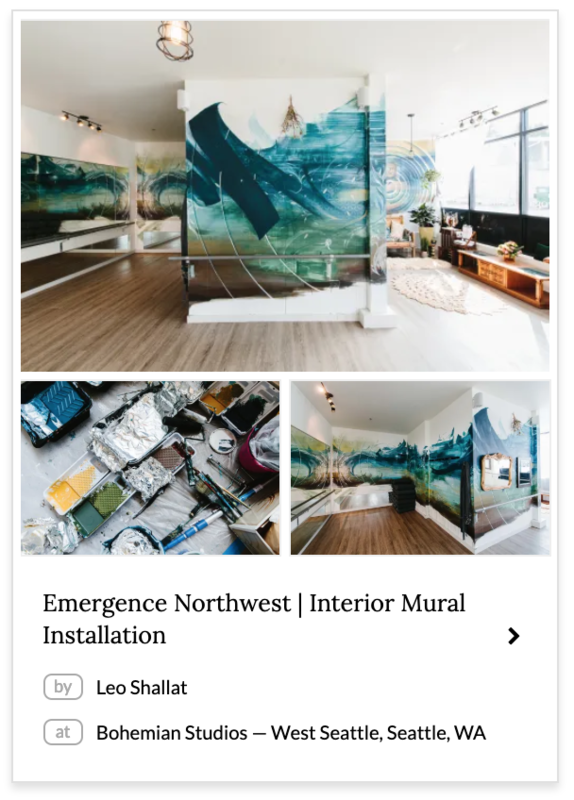 On one hand, you have the zen, soft, nature-inspired elements and then on the other a complex mural that brings an edgy, urban vibe to the space. Yet, they collide perfectly together! If I had to dissect this even further, I love these pieces because they’re somewhat like my personality: I’ve always been a city person, loving the vibrant and dynamic lifestyle of happening cities, while in the same time also desperately needing a refuge out in nature, between wild elements, fresh air, and unhindered habitats. What creators did you discover on Wescover and what do you love about their work? 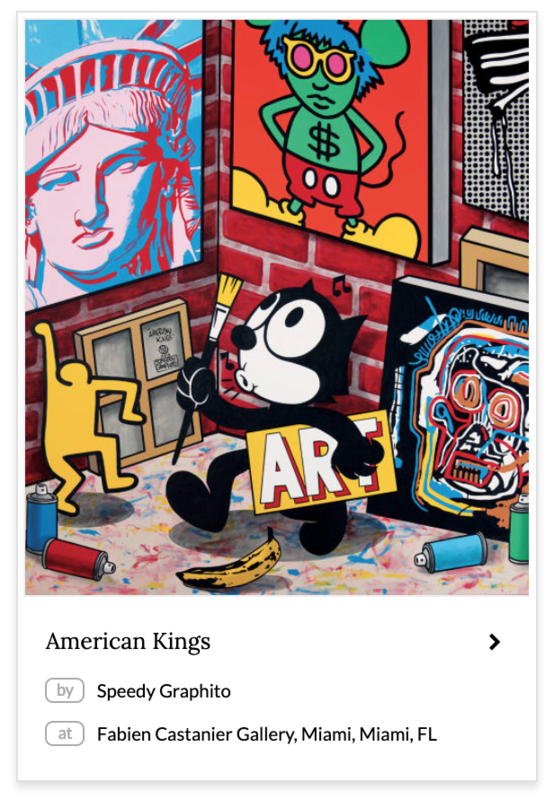 I absolutely love the works of Leo Shallat, Chor Boogie, Brolga, Speedy Graphito, Zulu Painter, Ricky Watts and No Touching Ground (which I discovered thanks to your recommendation). Also, other notable artists I love are Mark Gmehling and Illsol, which are not yet part of Wescover but hopefully they will be soon. I love their works because they’re thought-provoking and intricate. I could stare at them for hours and still keep finding layers and layers of meaning and inspiration. 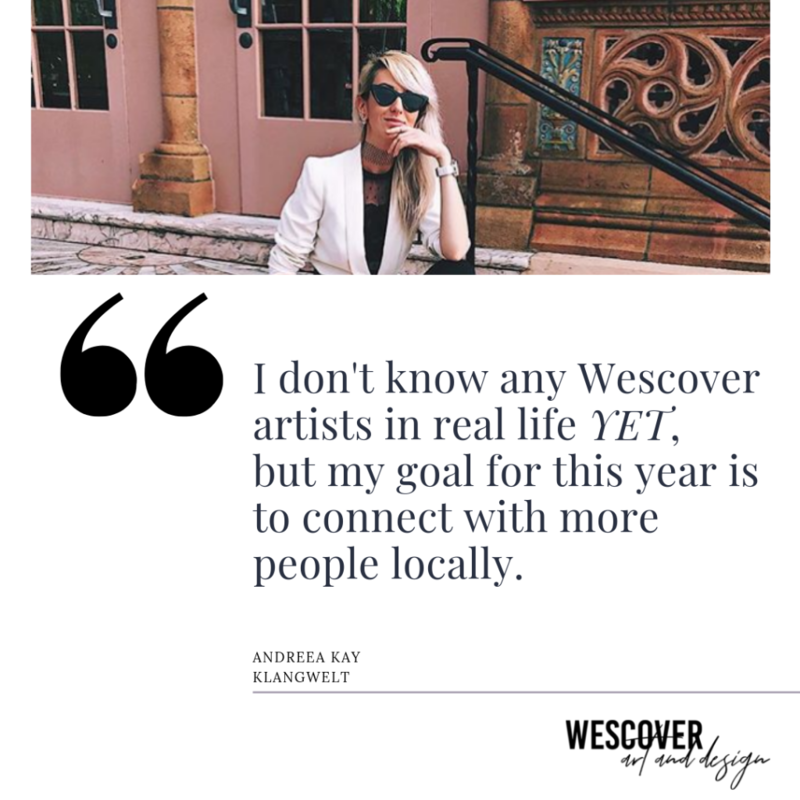 Klangwelt featured her favorite Wescover creators on her amazing Pinterest boards “Arts and Spaces” and “Amazing Street Art“— check them out and her website!